“Siri, start my car”, “Siri, Set the thermostat to 72 degrees” – saying that to the iPhone and having an AI agent perform those tasks sounds futuristic doesn’t it? It’s not from the future though, it’s now, thanks to the ambitious work of a third party developer who created something called Siri Proxy. As the name suggests, SiriProxy is a proxy server to Apple’s Siri assistant that allows for creating custom plugins that perform virtually any function, including tasks like remotely starting a car, locking and unlocking car doors, and even querying and controlling a home thermostat. The potential here is huge, and none of it requires any on-device hacks or jailbreaks because it’s handled away from the iPhone on a remote server. Due to it’s very early stage in development, setting up Siri Proxy isn’t the most easy thing in the world. You’ll need an iPhone 4S, and some experience with Ruby, certificates, web servers, and OpenSSL (you’re setting up a web server, after all). If that’s you, check out the source code and instructions on how to get it working here. On the SiriProxy projects page you can find more videos of third party implementations, including Siri interaction with Twitter, Dreambox, Plex, and even retrieving sports scores. With so much obvious potential, it wouldn’t be terribly surprising if Apple wound up opening Siri to iOS developers. Apple pays close attention to third party hacks and isn’t afraid to embrace some of the ideas born from these outside developers, the most recent example of which includes a wide variety of the features in iOS 5. Heads up to MacGasm and Adem Semir for the video links. I hope Apple opens a Siri API to developers, the potential is enormous and it would open a huge new variety of apps and updates for the App Store. i hope one day upon calling suri a virtual hand will come out of my iphone and stroke me off. Get a Prius or a Leaf. Then you won’t waste fossil fuel warming it up. 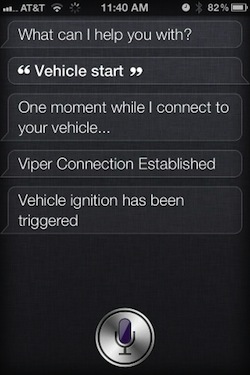 Siri – where did I leave my car? Siri – where can I trade in my wife? Siri – no facebook for my teenage daughter till she cleans her room.